Mint and Moneyer : what is visible on the coin is AIRE which had to be the beginning of SAIRET ON PINC which is SAIRET at Winchester. Date : Class XV, issued between ca. AD 1125 and 1135. Size : 17.4 x 20.3 mm. Weight : 1.43 grams. Grade : VF with the typical poor strike of this issue. But with a clear portrait and over all, fairly nice for a Henry I penny of this issue. Provenance : The coin came with a SPINK tag listing it as #337, with a not e that it is ex Pimprez hoard, #337. 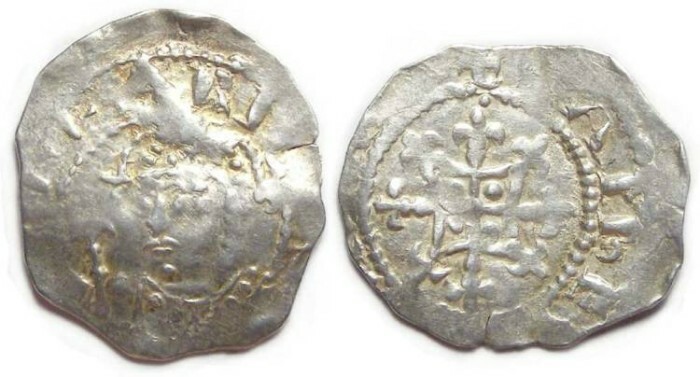 The Pimprez hoard was a hoard of 569 silver coins with a mix of British Henry I and Stephen pennies, various silver continental coins, plus 12 silver ingots. It was found near Beauvais a little north of Paris and after study by the Bibliotheque Nationale were released for sale to the Numismatic market. Obverse : 3/4 facing bust of Henry I, with HENRICUS around, with the hENRI visible (more than you see on many of these). Reverse : Quadrilateral on cross fleury, with a partial inscription AIRE visible, which is part of SAIRET ON PINC.